Had one try to steal a partridge off a wood pile on me once. I don't recall why but I had set the bird or birds down on the pile and was just a couple feet away when I saw the bird starting to get pulled into the pile!! He was in his white phase too. In general that is a Weasel when it's brown, and an Ermine when it's white! They change color phases on about the same schedule as the Varying Hare! Another thing, they can emit an odor on the same level as a skunk, just not as much! Those look like pocket gophers. Do you have small dirt mounds pushed up anywhere near where you parked your pick up ? They look a little too big for moles. No dirt mounds witnessed. Thats a gravel clay driveway. I've noticed that with my weasel encounters. They have no regard for my presence what so ever. What ever mission they were on, they never strayed because I was there. We caught one in a mnnow trap that was stowed in the shed one time. I'll go see if I can find that video. I can remember the very first time I saw an Ermine. I was hunting on the north side of thew back field, positioned in a brush pile of alder that we had piled there from expanding the field. It was rifle season, so late november, but we had no snow. All of the sudden I noticed a piece of white tissue tumbling and blowing erratically in the distance towards me through the woods. As it got closer I noted there was no wind, what the?? Then I saw it was alive. It ran right up to me and across my foot and started flitting around in the brush pile, obviously hunting. This became one of the indelible memories I keep from my times in the woods. Never saw a deer that day, but would not have traded the experience and the moment for ten. Neat picture. Did the weasel get in that minnow trap by mistake or did you leave some bit in there intentionally to catch him? Maybe he just smelled old minnow smells or such. I did not realize they could get into a spot that small. I know they are supposed to be bloodthirsty little animals but that sure is a pretty little critter. Its a video. He did it all on his own. I went in the shed for something and heard the commotion on a shelf. I had a minnow trap like that and I used to keep it on a nail in the garage, one day I went in and I heard a noise and come to find out, I had a chipmunk in the trap. After that episode, I stored the minnow trap disassembled! If there was such a thing (maybe there is one, and I don't know it because I would not give the NYT the time of day, let alone a gram of the stuff that falls behind my horse) as a "New York Times Best Internet Sellers List", this forum would be number one for about 700 weeks running! You could use part of them to make molasses! Those little buggers, weasels, not moles, can be very entertaining. Saw one run down a cottontail in snow about 10" deep a few years ago. There are weasels down here, but they are the two legged kind . There is a weasel here today. He's eating on some turkey scraps from dinner today. No we didn't eat one of the wild ones roaming around here. Hard to get a picture of an animal that moves quicker than the camera can focus for a shot. There are some squirrels around here, he can have a few of those to. 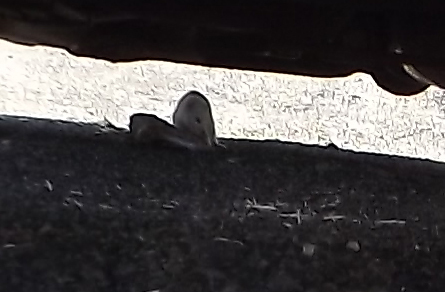 He was under the car in the shade. He kept jumping up into the car with his snack. Page created in 0.821 seconds with 40 queries.